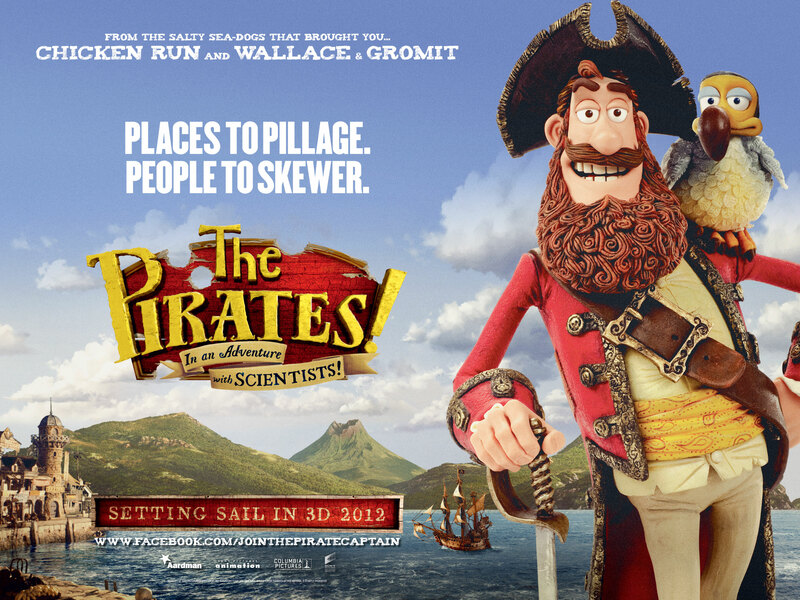 AN altogether more expensive trip this holiday was to the cinema, to see Aardman Animation’s new film The Pirates! in an Adventure With Scientists. This film shows off the stop-motion comedy skills of the geniuses behind Wallace and Gromit, as they take nice-but-dim Pirate Captain (Hugh Grant) on an adventure that kept the attention of our entire family, aged 4 to 43. (Bonnie had to sit on my knee due to Vue’s lack of booster seats, which saw her disappear, bum-first, engulfed by the flip-up seats). It’s obvious from the off that our ‘hero’, aided by ‘Number Two’ (Martin Freeman), Pirate with Gout (Brendan Gleeson), Albino Pirate (Russell Tovey) and Surprisingly Curvaceous Pirate (Ashley Jensen) are a merry if inept crew who stand no chance of winning the Pirate of the Year Award. After being humiliated by better brigands Black Bellamy, Peg-Leg Hastings and Cutlass Liz (Salma Hayek), Pirate Captain vows to plunder on, only to meet up with geeky failure Charles Darwin (David Tennant) in his pre-beard days. Darwin, like the audience, spots that Pirate Captain’s beloved parrot Polly is actually a Dodo, long believed extinct. The Captain and crew return to London with Darwin and his silent ‘Man-panzee’ Mr Bobo (who uses cue cards and Gromit’s trademark eye-rolling) to try and win a prize with Polly. But a psychotic Queen Victoria has vowed death to all pirates, and has plans for PC’s dodo discovery. There’s so much to look at that there’s little doubt this will be a film you need to see over and again for the visual puns. It’s a return to form for Aardman, with sequels in the pipeline, thanks to author Gideon Defoe’s series of Pirates! books. It’s a great family film if you fancy a trip to the cinema, but a word of warning – sneak in your own snacks. The ticket price for six of us at Vue was £30, before we’d even ‘treated ourselves’ to popcorn and drinks, which took the price up to over £65!